HBO veteran David Milch has come aboard to help pump some fresh blood into True Detective season 3. Entertainment Weekly has the scoop, revealing that Milch – best known for his work on Deadwood – has signed on to work with series creator Nic Pizzolatto, who has already turned in an arc for the opening two episodes of True Detective season 3. Sources close to EW caution that the collaboration between David Milch and Pizzolatto is in the very early stages, but even still, this is our first tangible sign of progress to come out of the True Detective camp in years. Following its blistering debut three years ago, the anthology series was essentially placed on ice at HBO after its second season, one which dramatically expanded the scope and shifted the focus to California, failed to deliver. 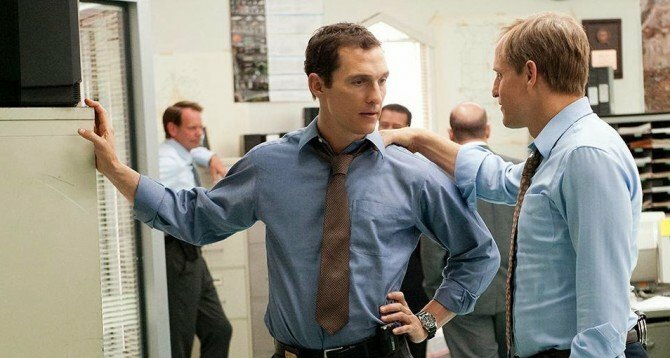 Since then, the resounding message from the network has been that True Detective was dormant, not dead, and those who have been keeping one ear to the ground will know that both Michelle Monaghan and Matthew McConaughey have since expressed an interest in returning to the TD universe for future episodes. Could both actors reprise their respective roles? Or will we see a scenario in which HBO takes a leaf out of American Horror Story‘s book and casts Monaghan and McConaughey as totally new characters? Even for all the acclaim that the latter garnered for his portrayal of Rust Cohle, it would certainly be an interesting way to shake up the format. Circling back to EW’s status report, though, and True Detective season 3 has flickered into life at HBO. Without an official green light, new episodes are far from certain, so it’ll be interesting to discover if David Milch’s appointment can be enough to truly set the wheels in motion.